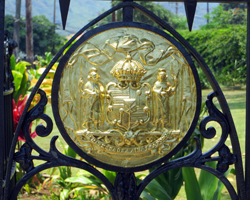 Mauna Ala: Discover Hawaii History at Honolulu’s Royal Mausoleum State Monument. Visit Mauna Ala and Discover Hawaii's Kings and Queens! I first visited the Mauna Ala Royal Mausoleum State Monument as part of a seventh grade field trip during the Hawaii history portion of our studies. Notice that I said this Hawaii attraction made up only part of a field trip. That’s because even though the grounds are regal, the location is majestic, and the historical significance is monumental, this scenic Hawaii sightseeing spot is ultimately just a small cemetery. Nevertheless, it’s also the only royal burial ground in all of the United States! Located on a street lined with grand old cemeteries, it’s easy to drive right past the narrow driveway at the entrance of Mauna Ala. And, yes, you could keep right on driving to any of the other nearby attractions such as the Nuuanu petroglyphs, Kapena Falls, Judd Trail, Punchbowl Crater, the Nuuanu Pali Lookout, or others. But if local history is your area of interest, or if you’d just want to take advantage of so many Hawaii activities being so close together, then you really should consider turning the car around and going back to visit the Royal Mausoleum of Hawaii. In addition to Kamehameha II, III, IV, and V, there are four Hawaiian queens (including Queen Emma) buried in the Kamehameha Tomb at the Royal Mausoleum. 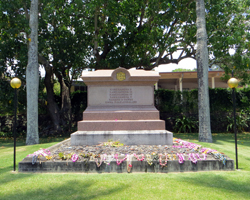 The Kamehameha Tomb also contains the remains of seven princes, three princesses, 23 kings of chiefs, four high chiefs and chiefesses (including Bernice Pauahi Bishop and her husband Charles Reed Bishop). The Kalakaua Crypt contains the remains of King David Kalakaua, Queen Kapiolani, Queen Liliuokalani, plus the bones of three princes, five princesses, four chiefs and chiefesses, and several others who were related to the royal family. 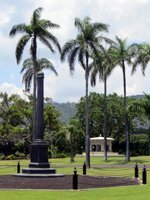 Finally, the remaining tombs at the Royal Mausoleum of Hawaii hold the remains of numerous other important governing figures during the time of the Hawaiian monarchy. Click for a complete list of individuals laid to rest at Mauna Ala.
Two of Hawaii’s kings are not buried at this site. The final resting place of Kamehameha the Great – the king who unified all the Hawaiian Islands – is in a secret location that has never been discovered. 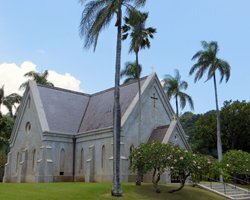 King William Charles Lunalilo, the first democratically elected king of Hawaii, who reigned for just one year and 25 days, is interred on the grounds of Kawaiahao Church. Initially, the royal remains at Mauna Ala were interred in what is now the royal chapel – the primary structure on the site. However, that building was quickly filled and the tombs were moved underground. This site holds national historical significance because it is exempted from U.S. land laws. As a result, the Royal Mausoleum of Hawaii is one of the only places in the nation where the state flag is permitted to fly independent of the American flag. Another such place is Iolani Palace. Like I mentioned above, the Royal Mausoleum State Monument is close to numerous other Hawaii cultural attractions and fun Hawaii things to do. As a result, you could easily pay your respects to the Kings and Queens, and then transition quickly to other nearby Hawaii vacation activities.